Start reading Practical Statistics for Data Scientists on your Kindle in under a minute. Peter Bruce founded and grew the Institute for Statistics Education at Statistics.com, which now offers about 100 courses in statistics, roughly a third of which are aimed at the data scientist. In recruiting top authors as instructors and forging a marketing strategy to reach professional data scientists, Peter has developed both a broad view of the target market, and his own expertise to reach it. Andrew Bruce has over 30 years of experience in statistics and data science in academia, government and business. He has a Ph.D. in statistics from the University of Washington and published numerous papers in refereed journals. He has developed statistical-based solutions to a wide range of problems faced by a variety of industries, from established financial firms to internet startups, and offers a deep understanding the practice of data science. Data science is a fusion of multiple disciplines, including statistics, computer science, information technology and domain specific fields. As a result, a several different terms could be used to reference a given concept. Key terms and their synonyms will be highlighted throughout the book in a sidebar within the text. 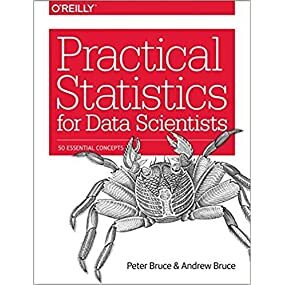 This book is aimed at the data scientist with some familiarity with the R programming language, and with some prior (perhaps spotty or ephemeral) exposure to statistics. Both of us came to the world of data science from the world of statistics, and have some appreciation of the contribution that statistics can make to the art of data science. At the same time, we are well aware of the limitations of traditional statistics instruction: statistics as a disciple is a century and a half old, and most statistics textbooks and courses are laden with the momentum and inertia worthy of an ocean liner. To lay out, in digestible, navigable and easily referenced form, key concepts from statistics that are relevant to data science. To explain which concepts are important and useful from a data science perspective, which are less so, and why. This is an excellent book for either repeating key concepts of statistics and machine learning or for closing some gaps one might have. There are plenty of references to other sources to dig further. A reasonable survey of core statistical methods, not super-clear, plus a slapdash review of a few machine-learning models, with very little explanation. * Assumes that you know R. Lots of code, no explanations of the code. * The last part of the book is a thin and purely practical survey of ML models. You don't get much understanding of how or why things work. 57 people found this helpful. 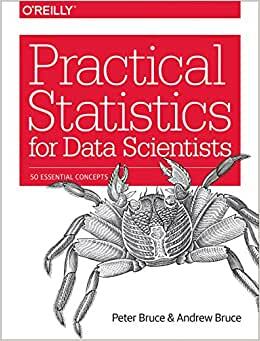 Excellent introductory text for a comprehensive overview of statistics! The github repository augments the content very well and provides added value for the statistical topics covered in the book. Both of the Bruce brothers are statistical gurus and this fact is evident in the writing, which is both informative and witty. Peter is the president of Statistics.com and is well-versed in providing statistical instruction to students of all ages and levels. He is also a proponent of resampling and one of the developers of the excellent Resampling Stats software package for Excel. It is true that the textbook does not provide in-depth coverage for all topics, but I don't think that was the intent of the authors. However, the text DOES provide an excellent introduction to topics relevant to students and data scientists. After reading the text and working through the examples, you will be equipped to further your knowledge in whichever topic you require for you data analysis task. I love this book as a reference. Clear, efficient but detailed explanations. It is not designed as a textbook but as a reference. When I wonder "what is that test used for again?" or "what was that formula?" this is the first thing I reach for. Sure, Google has become universal for that too, but I like having a single hard copy reference that I can get to know and that becomes a trustworthy old friend. This book is taking on that role for me. 4.0 out of 5 starsA modern and very readable book that nicely explains high-level concepts. First of all, this book is not for you if you want a deep and thorough explanation of statistical concepts. It serves a completely different purpose: to familiarize a reader with high-level concepts; to enable them to continue their statistics education elsewhere. I found this book a very engaging read: it sets itself apart from other books on statistics in clearly telling which concepts are not-so-relevant for the modern computerized explorative analysis toolset. Many concepts that are presented in classic books on the subjects are rooted in 20s and 30s where computing power wasn't available and researches resorted to various pre-calculated distributions and formulas to do their work. A modern data-scientist's approach would eschew some of the old ways and instead rely on randomization, resampling and computing power. This book not only tells what something is, but also why it is that way and if a concept is still relevant today. 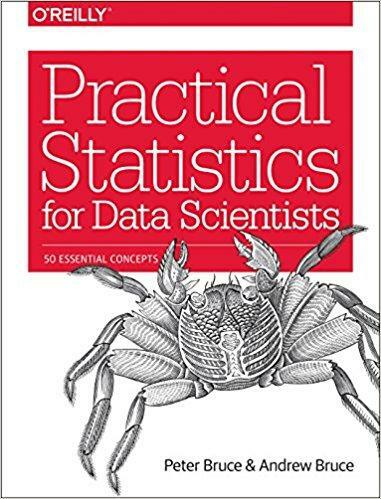 I can recommend this book if your statistics knowledge is spotty or ephemeral, it serves its purpose well and doesn't bog down the reader with (sometimes) unnecessary mathematical concepts to demonstrate an idea. 1. Lack of examples in programming languages. 2. Complete lack of exercises (at least 1-2 exercises are necessary). 4.0 out of 5 starsVery well-written survey. Does not go into enough depth in any area to create proficiency. This book is well written and packs a substantial amount of information into a small number of pages. It is best used to get a survey and overview of many of the facets of the domain of data science. This book will not teach you anything in enough depth to actually execute it well — it will teach you just enough to be dangerous and not realize when you've gone off the rails. I recommend it for managers who may never go into technical depth, for people considering whether or not they are interested in data science, or as a preview book to create a framework from which to hang more detailed understanding. Although this is an introductory book, it assumes you can already program in R. If you can't, either accept that you won't be able to follow the specifics of the examples, or read The Art of R Programming and/or R for Data Science. I dislike that the authors make a number of categorical statements of the form "Data Scientists do this" or "Data Scientists don't need that". I disagree with many of these assertions and I think they have taken a definition of "data science" which is narrower than the prevailing consensus in the industry. This book has some errors (see, for example, the confusion matrix on page 196) but overall the accuracy is above average relative to recent norms. As other reviewers have noted, the author's github repository for the book is currently empty. If that's important to you, check it under "andrewgbruce" on github and make sure it's been updated before you buy the book.